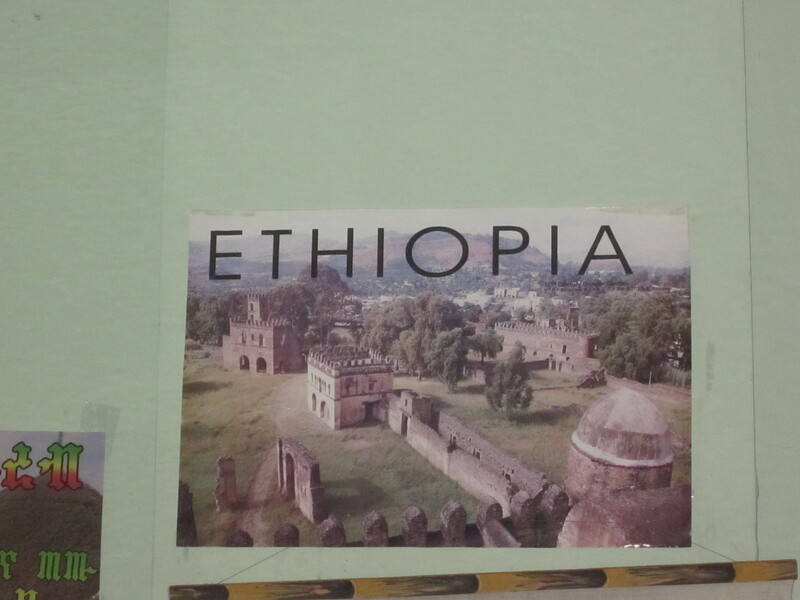 “Have you ever been to Ghana,” he asked. I shook my head. “No, I’m just an expert at eating with my hands…or any other utensil,” I added. 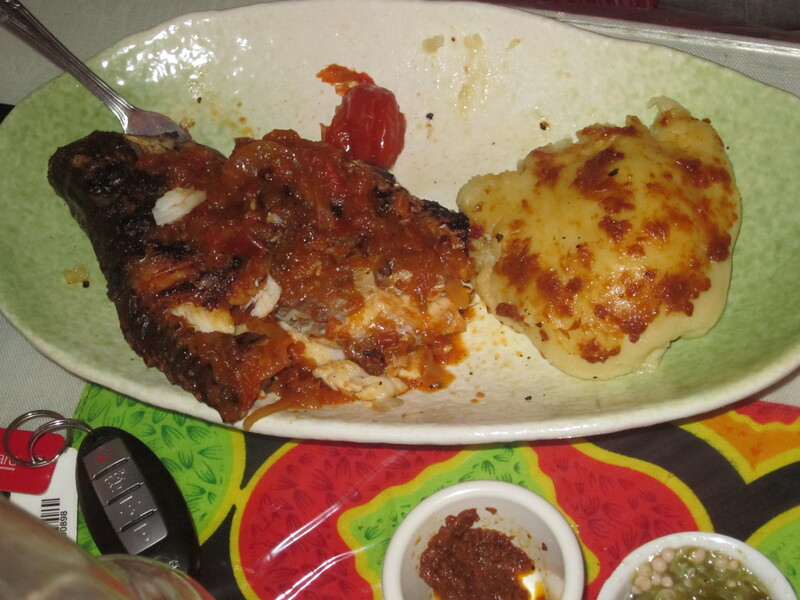 The utensil in question for this meal was actually a plastic-wrapped ball of banku. Following my eating instincts, I used it to scoop up the gravy from the bowl—with my right hand of course. 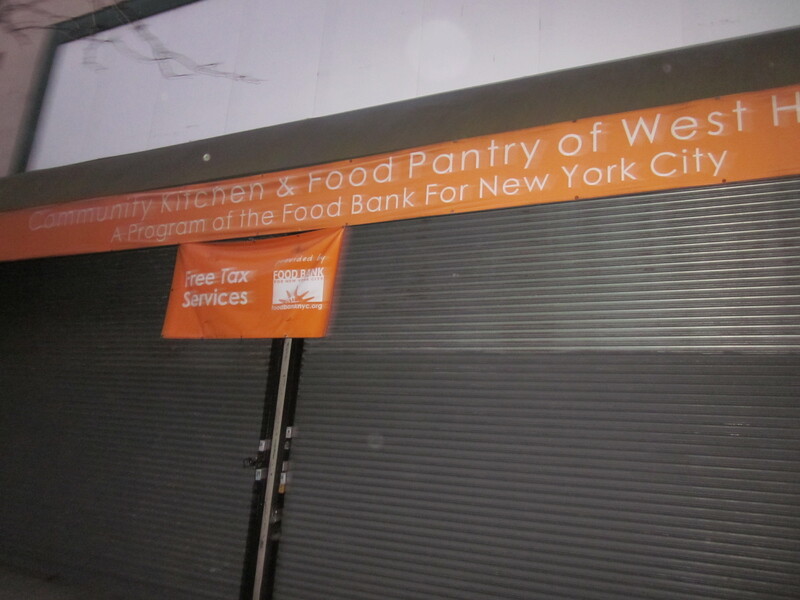 We were in the Bronx, steered there by Gerry after a seemingly inexcusable faux pas. Suffering from a momentary lock of his ancient brain, Gerry’s first choice was a Pakistani restaurant, also in the Bronx that he himself chose for our group several years ago called Rawal Ravail and was written up in these pages (see Biryani Joy). 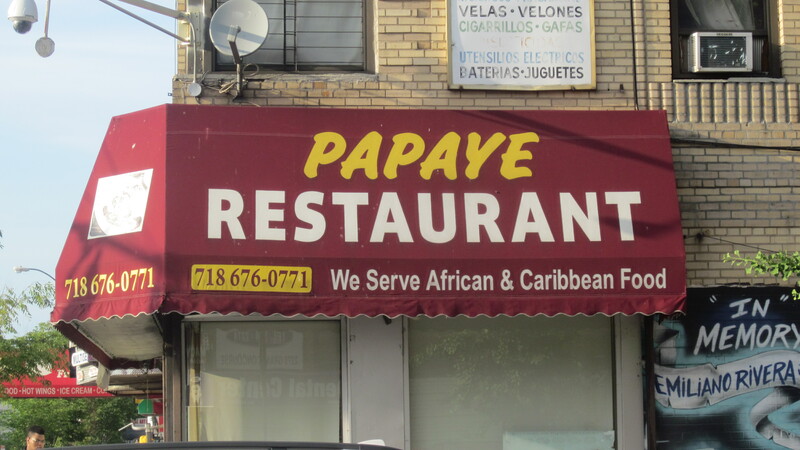 When realizing his mistake, he righted himself quickly with his choice of Papaye. And after our delicious dinner there, his blunder was immediately forgiven. 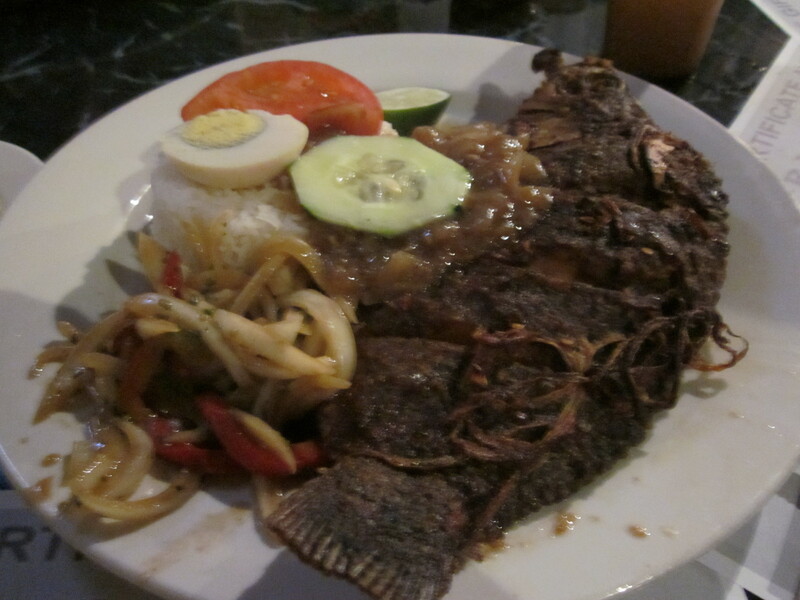 He pointed to the photo on the menu of the grilled tilapia smothered in peppers and onions. “Fish?” the waiter wanted to make sure. “With fufu, plantain, rice?” the waiter asked. Eugene was lost. If it isn’t something served in a chafing tray on a cruise boat buffet, it’s all foreign to him. 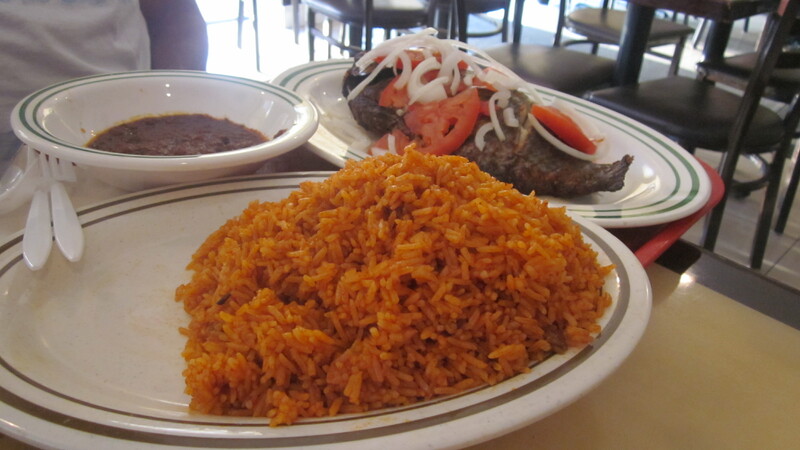 With our aid, Eugene settled on the accompaniment of jollof rice. We started with skewers of meat; indistinguishably grilled beef that was high on the chewing quotient. Thankfully, the skewed meat was the only low point to our meal. 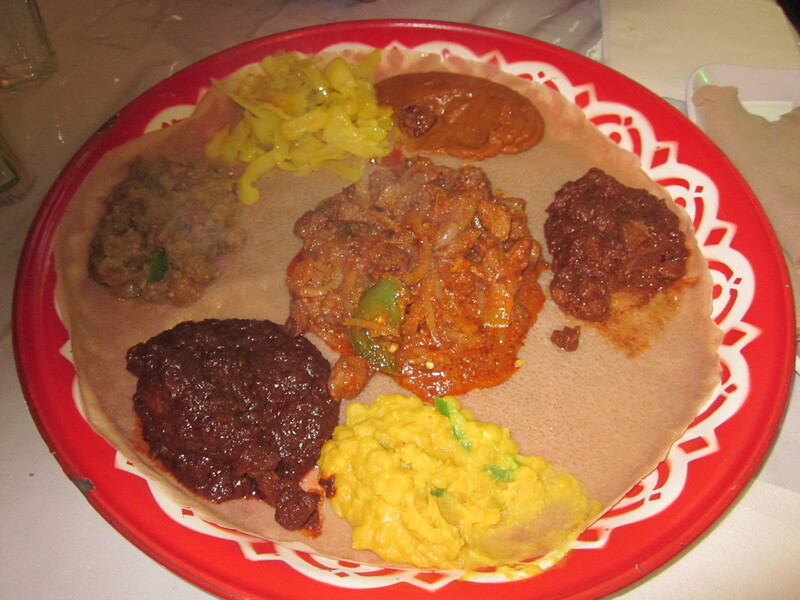 The meat options were limited, pretty much to either goat or fish with the variables in what accompaniment you ordered. I, as I said, chose the banku, a mound of mashed fermented cornmeal that was wrapped in plastic while the crimson-tinged jollof rice that came with Eugene’s bloated tilapia was enough for the five of us to share. 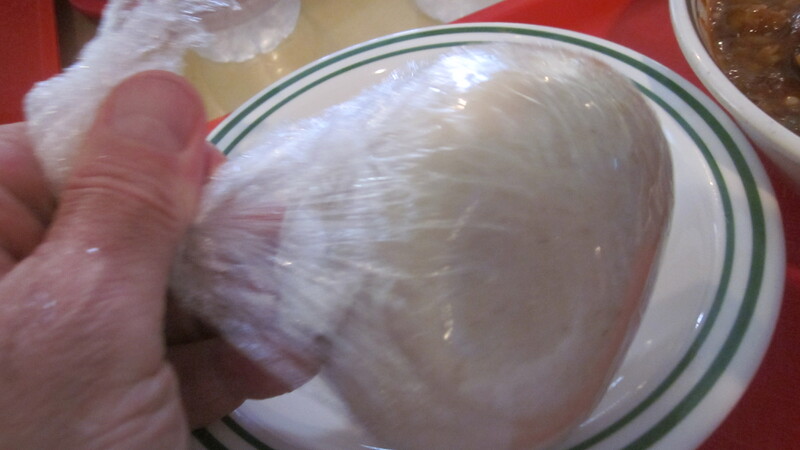 Gerry and Zio both had fufu; mashed yucca formed into what looked like a softball floating in their rich gravies. 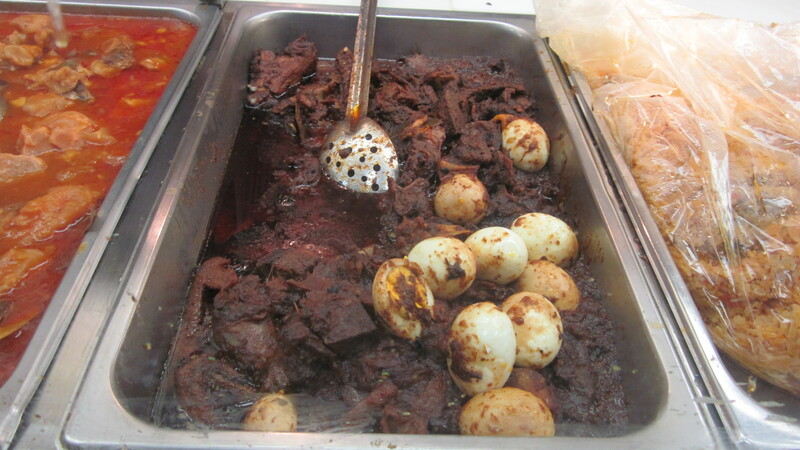 Also within the spicy gravy were pieces of tender goat that Zio picked apart with the plastic utensils provided. Mike from Yonkers, in an attempt for something firmer than the plastic spoon he was given, requested repeatedly for a metal fork to be able to eat the goat and rice balls that came in his huge bowl. “I just can’t eat this with this thing,” he said, waving the greasy spoon at the befuddled waiter. Eventually a metal fork and spoon came his way and as he usually does, he then methodically worked his way through the bowl with uninterrupted diligence. After cleaning my hands and accepting the compliments on my African eating habits from the man from Ghana, I sat back down and, along with the others, waited, as we always do, for Mike from Yonkers to surrender to whatever might be left on his plate before we could pay and make our way back out to the Grand Concourse. Each of our one dish meals contained enough food (and starch) to sustain a man (or woman) for many hours before their next meal. But in Zio and my case, that wait was just a few minutes as we spied a Carvel ice cream shop down the block also on the Grand Concourse. “I think we need some ice cream to calm our over stimulated palates,” Zio suggested. 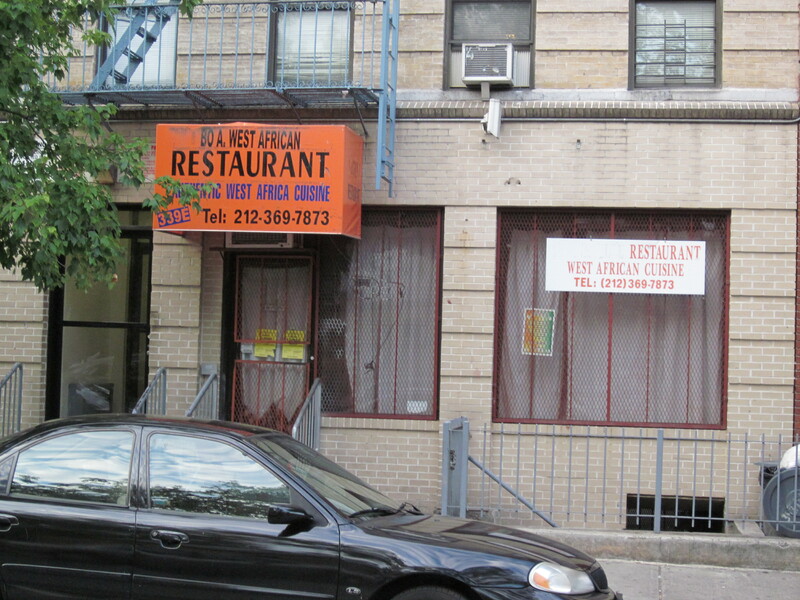 The Fusion Files: French Pizza in Harlem by way of Africa. 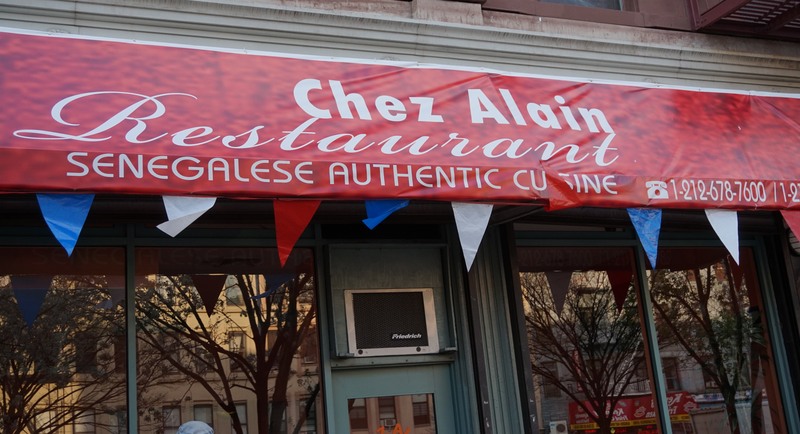 I’ve noticed a few pizzerias in Harlem that have a French accent. At first glance, crepes and pizza might seem like a natural mix. And at Oui Oui there was a French/English menu where one of the crepes was named for the largest city in Mali. Was I on to something here? Why order a pedestrian “Italiano” pizza when a merguez was available? And so I did. Not expecting much, I was pleasantly surprised that the piquant sausage made of lamb and beef gave the pizza a very welcome kick to it and was, in my estimation, a worthy substitute to traditional Italian sweet sausage. The “Harlem” crepe, however, was another story and one not worth dwelling on. 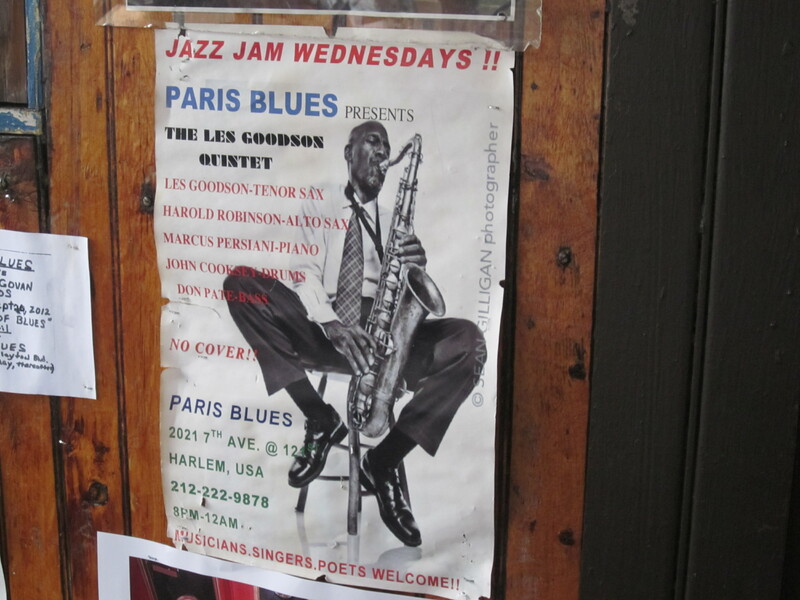 Still, everything was made in Harlem. And what could be better than that? 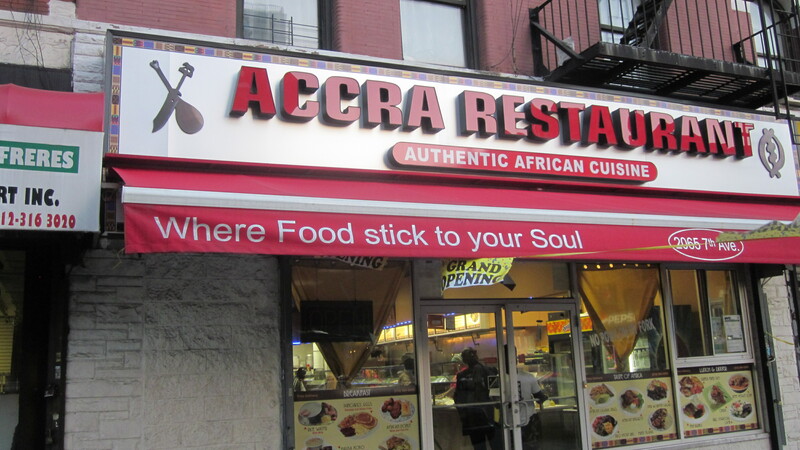 After learning that we would be traveling to Jamaica, Queens for our next eating adventure, Zio commented that it was our group’s first outing to that section of Queens. He was excited about it, but he had no idea at the time that before our dinner was over, he would, quite literally, be smothered in affection by the ample and genial, to the extreme, hostess/waitress of Maima’s Liberian Bistro & Bar. I’m not sure why Zio was looking forward so much to visiting Jamaica. From my initial perspective cruising down Liberty Avenue, there wasn’t much more to it than countless auto glass repair service centers. And then after passing the York College campus and turning onto Guy R. Brewer Blvd, things got even dicier. 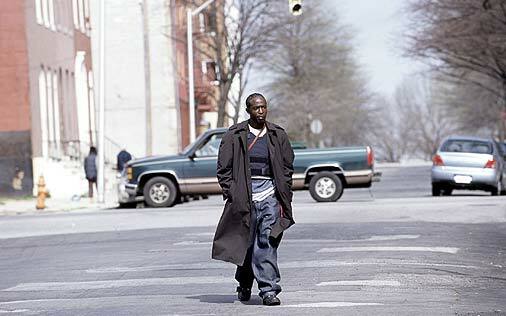 The streets had a dangerous aura to them. It wasn’t dark yet, but the area reminded me somewhat of the burnt out street of Baltimore depicted in the television series “The Wire.” The only bright spot on the street was my destination: Maima’s. Later, Zio confessed to “late night drives” through the neighborhood; his artistic eye appreciative of the dank, post-apocalyptic look of the place. Of course Zio, observed the neighborhood from the safe confines of his used BMW and, wisely, never got out of the car during those nocturnal excursions. I was the first to arrive and the first to meet, Janis, the aforementioned hostess. Stevie Wonder was playing on the stereo. 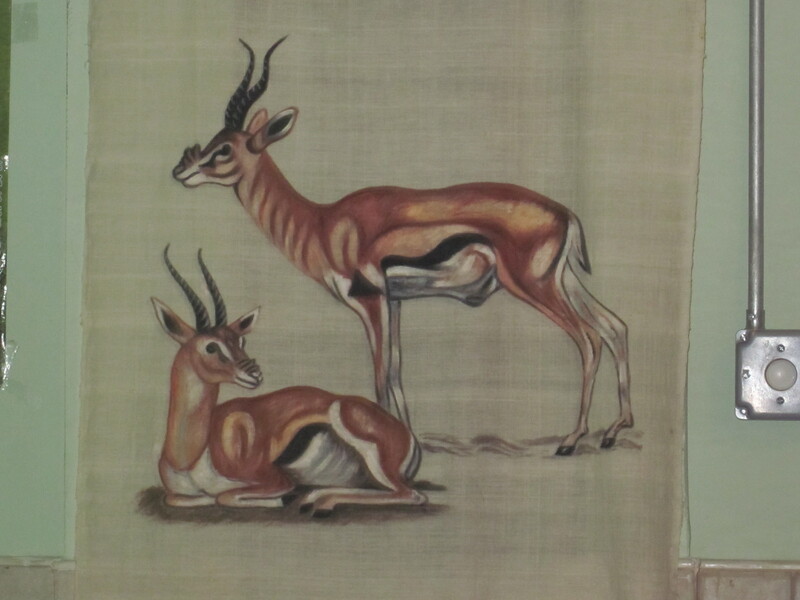 There was a small wood paneled bar and African-themed paintings on the wall. 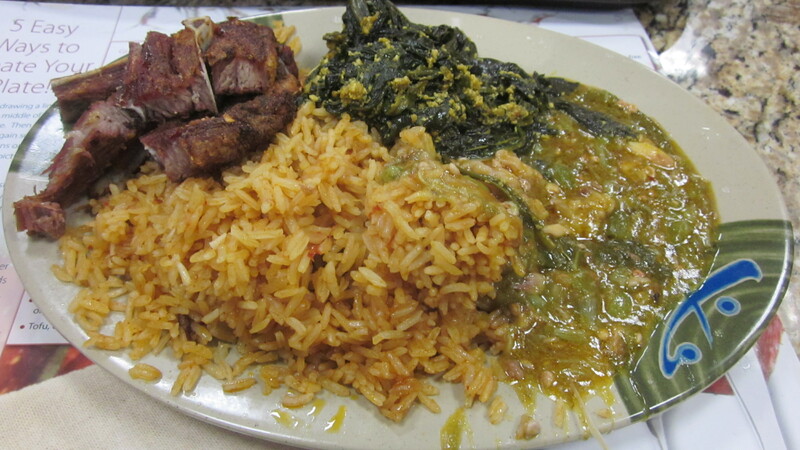 We’ve been to many other African restaurants over the years, but this was our first taste of Liberian food. 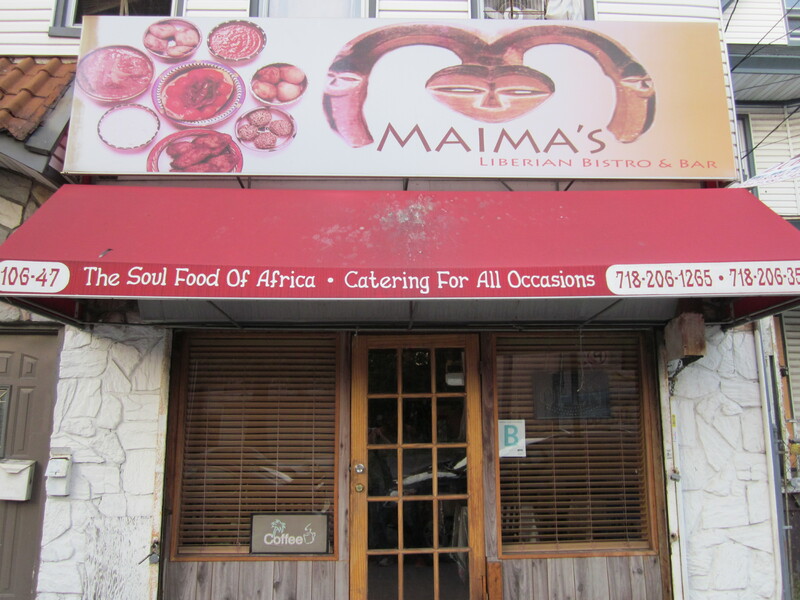 And compared to the other African restaurants, (the late Treichville, Salimata, B&B’s African American Restaurant, and African American Maraway) Maima’s was by far the most “elegant,” thus the inclusion of the word “bistro” in its official name. With the help of one of the few African patrons in the small restaurant, Janis put together three of the tables to make room for our group of six. As soon as I sat down at the extended table, a cold Corona in front of me, Eugene, Mike from Yonkers, and Zio arrived. His deviation from what the rest of us were ordering and the authoritative way he said it must have stirred something deep inside Janis’s generous soul. Almost instantly there was “chemistry” between the two. After maneuvering through traffic on the Belt Parkway, Gerry entered followed soon after by Rick. The menus were of the take out variety, but as take out menus go, Maima’s was colorful and printed on thick, glossy paper. Each day there were daily dishes offered. 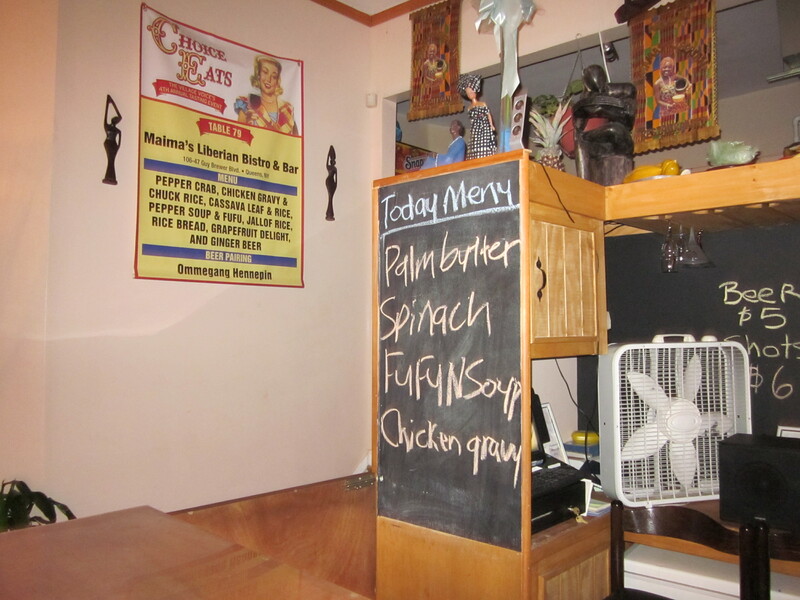 We were there on a Tuesday and had the option of either Spinach or Palm Butter, but by the time we were ready to order, Palm Butter had been erased from the chalkboard. 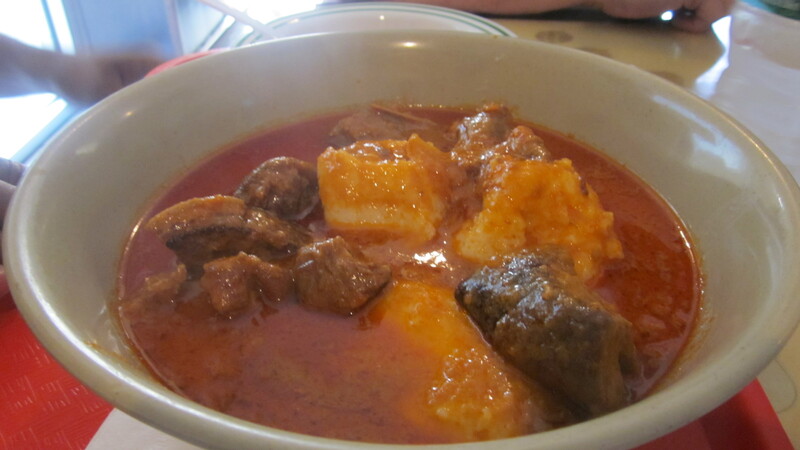 Besides the daily offerings, fufu & soup was available along with fresh fish, “fried, toasted, or steamed.” In fact, fufu, the ball of doughy, beaten (literally) down version of cassava, was available with everything, as we soon found out. 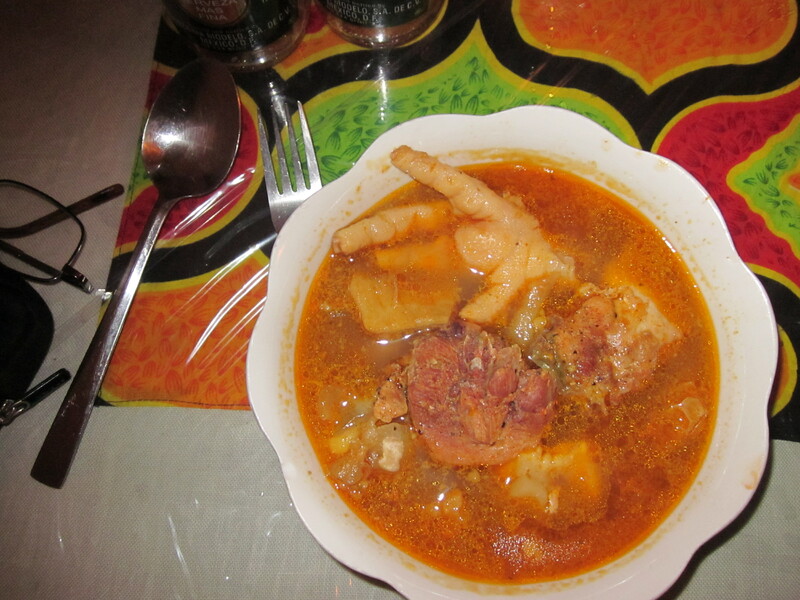 The soup was pepper soup, that, according to Janis, was a mélange of meats; chicken and beef, and seafood along with a big pale ball of fufu. Gluttons for heat, we scoffed at her warnings and dug in. I tried peeling the shrimp but gave up, eating the thing whole. Before I got more than two bites in, however, I was overcome by an uncontrollable attack of the hiccups; a sign that I’ve surpassed my body’s spice index. Sucking down ice water, the hiccups subsided and maybe that I’d already numbed my lips and the lining of my throat; I was able to continue to eat the fiery shrimp. Janis brought Gerry and Rick their “spinach” entrees. The spinach was served chopped in a bowl with bits of meats and seafood throughout. 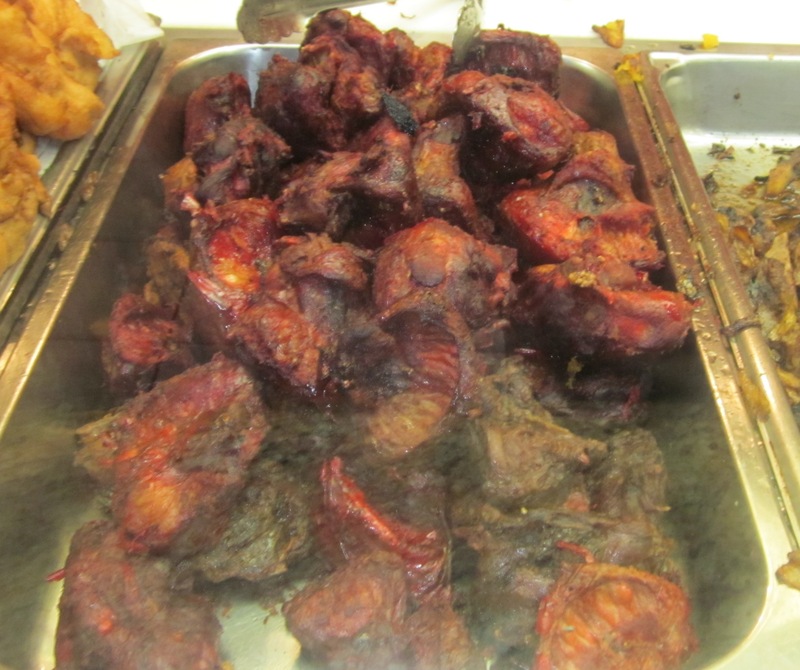 From what I sampled, those bits were more tiny pieces of meat attached to small bones. 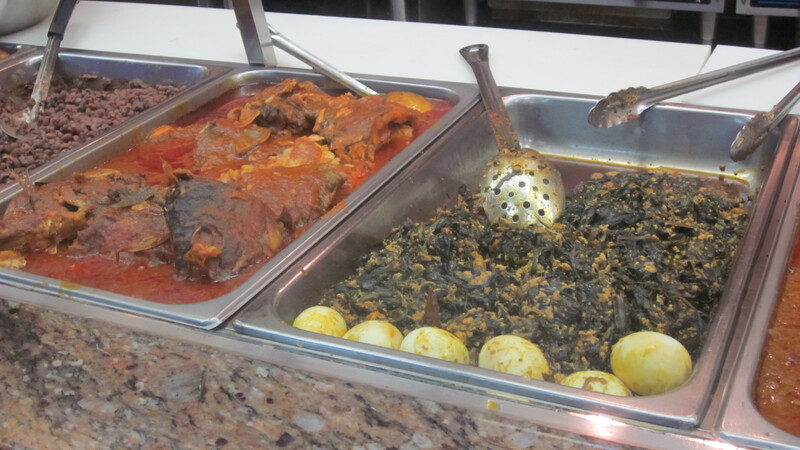 The spinach also came, of course, with a ball of fufu as did the pepper soup that Eugene and I were having. I was about to try the fufu when Janis rushed to my side and added a dollop of the same peppery paste that was on the shrimp to the otherwise bland fufu. 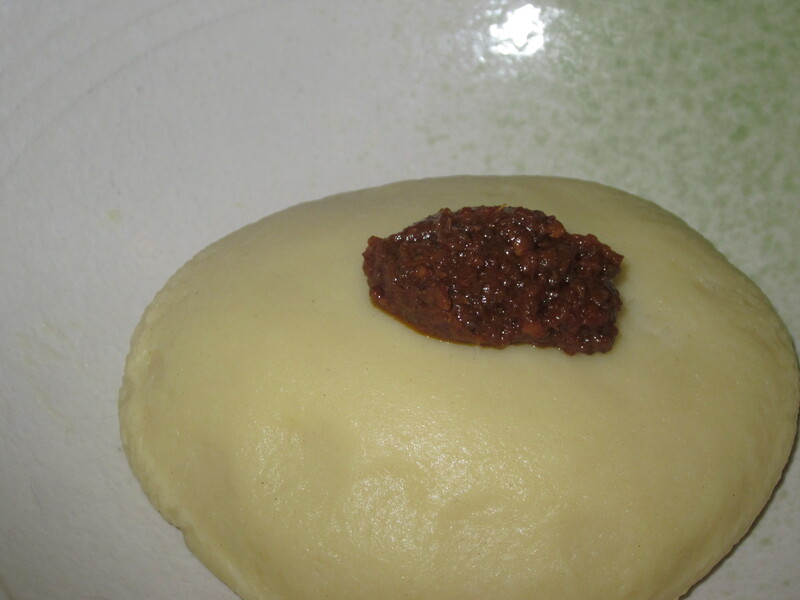 I used my hand to break apart the dense ball of fufu and added a small amount of the pepper sauce for flavor. 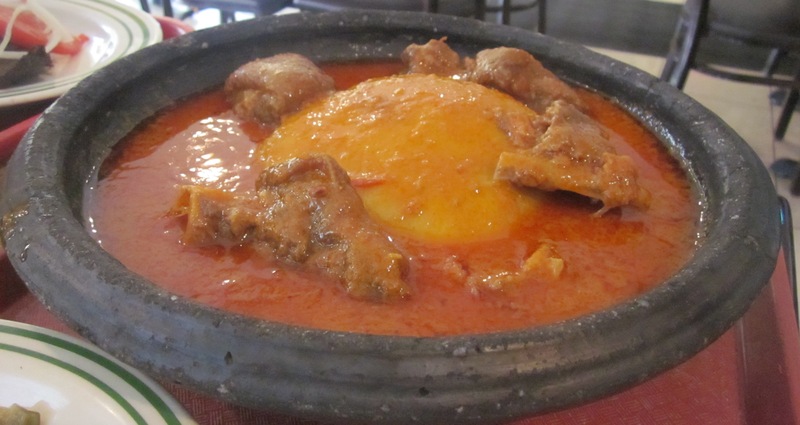 Fufu with a dollop of pepper sauce. 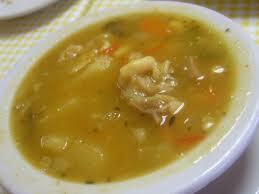 And then I turned my attention to the soup where a four-fingered hand or foot, I couldn’t tell, was jutting from. So life-like was this appendage that if I dared look closer I might have spotted fingernails or maybe knuckle hair. But for that reason, I kept my distance from it. The broth was indeed peppery, but mild compared to the hiccup-inducing shrimp. Inside the broth, along with the appendage, were pieces of tripe, gelatinous beef tendon, small pieces of chicken on the bone and even smaller blue crab bits. Waiter, there’s a hand in my soup. 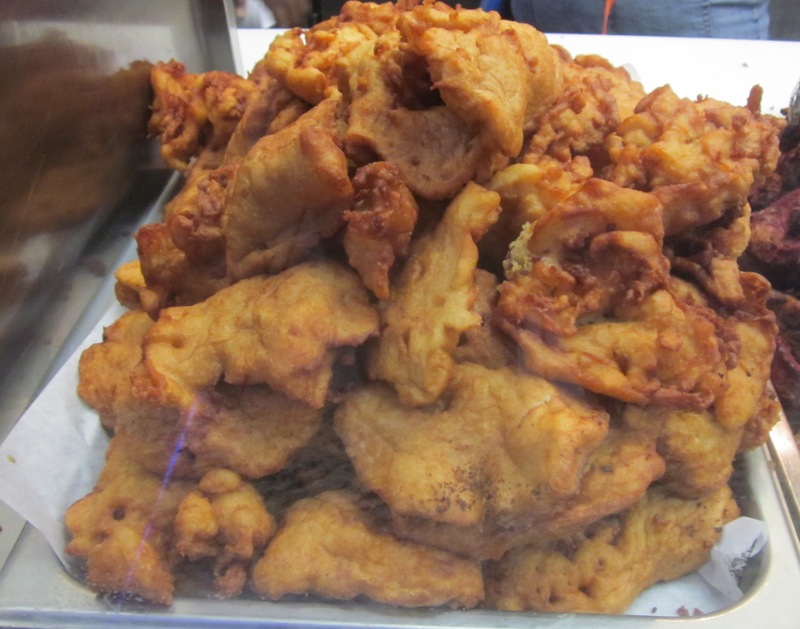 With fork and knife, Mike from Yonkers delicately began the dissection of his “toasted” fish which, translated, meant that it was grilled while Zio’s approach to his fried fish was more primitive; pulling apart flesh from bone with his palm oil stained fingers. “What kind of fish is it?” I asked him. “The fresh kind,” he muttered without looking up, his mouth partially stuffed with food. It was about then when Zio noticed Janis bringing a bagged order to a customer waiting outside. Along with presenting him with his order, she gave the customer an overly friendly hug. When she returned, Zio, wiped the grease from his lips. “I’m a little jealous now,” he said to her. With that, she grinned, went behind him, wrapped her defensive lineman-like arms around him and began to smother him with affection. 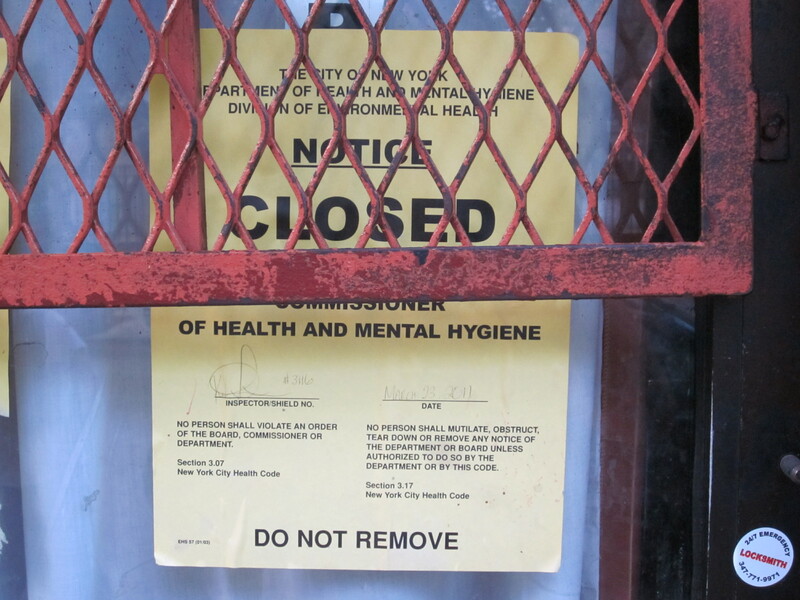 Thankfully, Zio had completely drunk the man-sized Coke to keep his now overworked heart stimulated otherwise we might have had to rush him to nearby Jamaica Hospital. Rick was moaning as well, but not because of an outpouring of affection. The fufu had done him in. 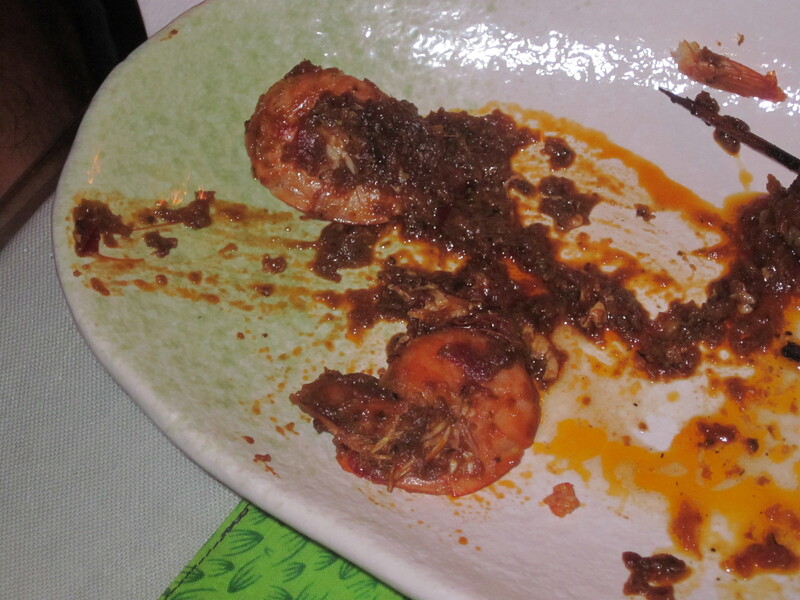 “I think it might be expanding in my stomach,” he said of the half ball of fufu he had already ingested. 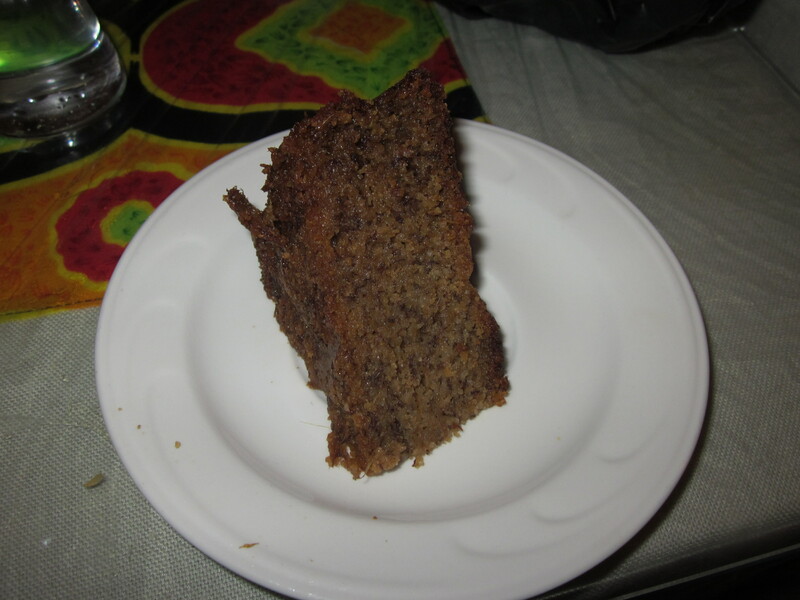 Still we had to try the rice bread; a sweetened piece of cake that tasted like banana bread and was made, I presume from rice flour and bananas. 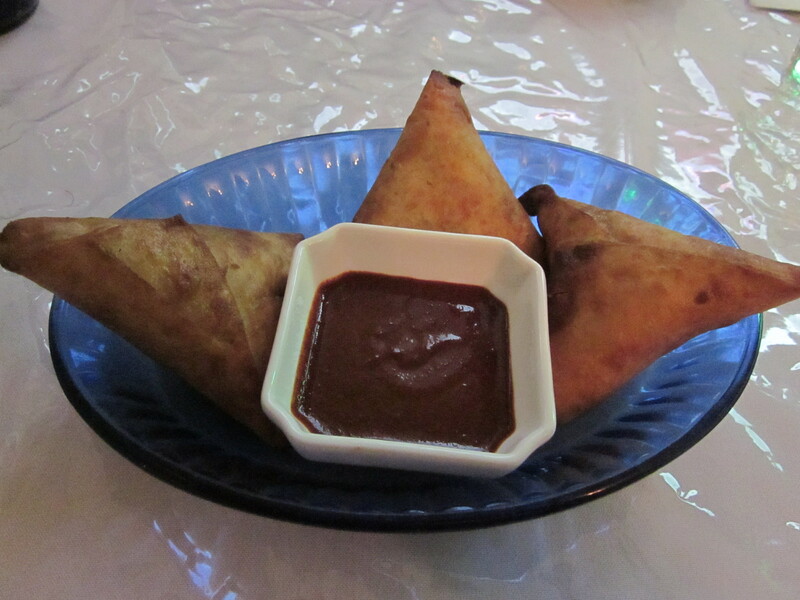 Our experience at Maima’s was certainly memorable even if the food did not quite make it to the top of our self-monitored charts. My only regret was that we never got to try the palm butter special. 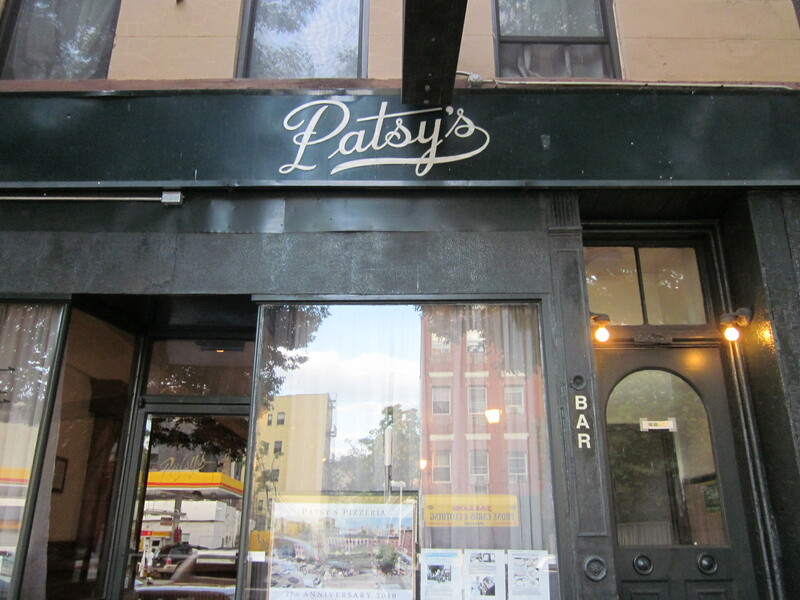 “Next time you come, you can call ahead and they’ll hold it for you,” Janis said. “Just call Mama,” was her glowing response. 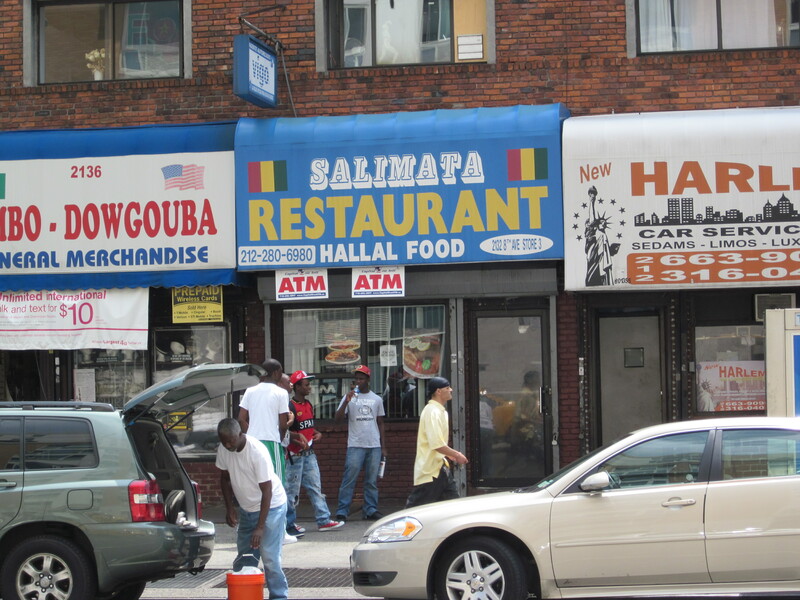 I must have passed Salimata, the restaurant chosen by Mike from Yonkers, hundreds of times and really never noticed it there, not very far from where I reside. 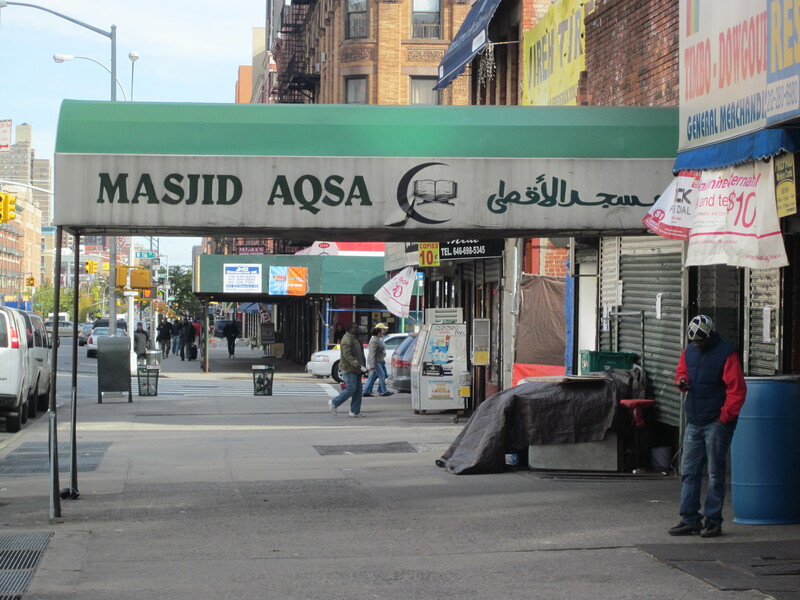 Maybe it was because it was located in the shadow of the Masjid Aqsa Mosque, kind of a community center for the areas West African Muslims who populate the area known as Little Senegal and always bustling with activity. 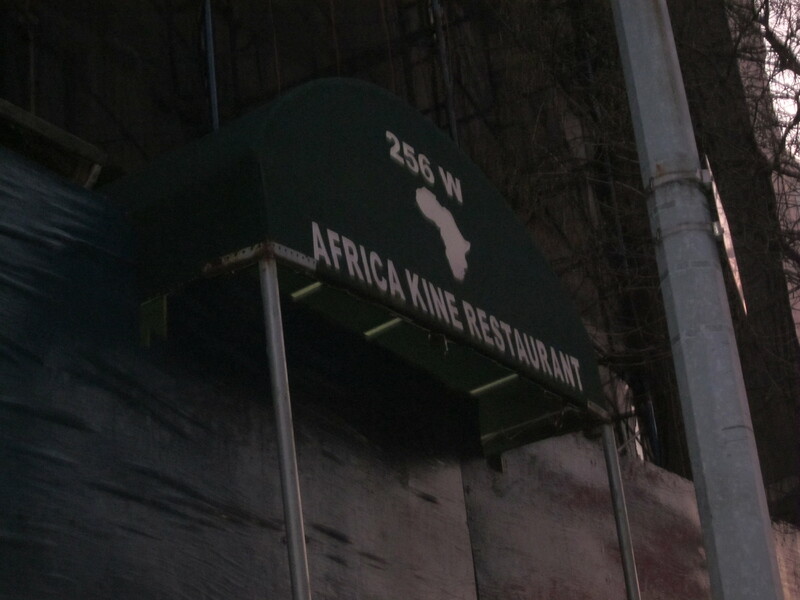 Or maybe I was unaware of its presence because it just blended in with the many small, family-run African restaurants in the area. Like Gerry who chooses based on how long it takes us to get to a place, or Eugene who looks for the untried, no matter if edible or not (see Arzu), Mike from Yonkers has an African thing going; his last two picks; Treichville and African American Marayway both featured the cuisine of the countries of West Africa. 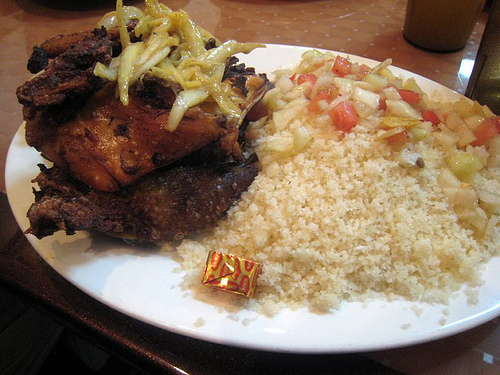 Salimata’s represented Guinea, though all of us would be hard pressed to distinguish the subtle differences between the food of Guinea with that, for example, of Ghana or even, Guinea-Bissau. But getting to Salimata couldn’t be any easier for me so I certainly wasn’t complaining about his choice. We told him we were going in to eat at Salimata now. Maybe later, someone unwisely said thinking he might be gone by the time we finished. He nodded approvingly at our dining choice that, we soon found out, also served as his base of operations. The only table big enough to handle our group of six was close to the front door and the constant commotion of take out customers and taxi and livery cab drivers moving in and out, had us keeping our jackets on to stay warm. 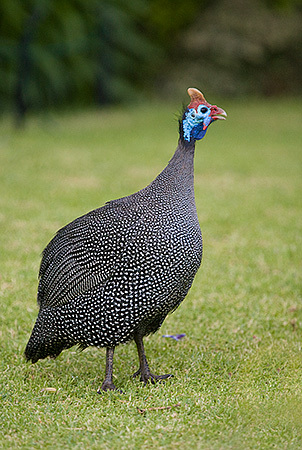 All of us were pleased that now, after two absences, Rick had rejoined us, and taking a quick glance at the menu and without any hesitation he decided on the guinea fowl, a variation on either pigeon or chicken, depending on how you approached it. Guinea fowl: The before picture. 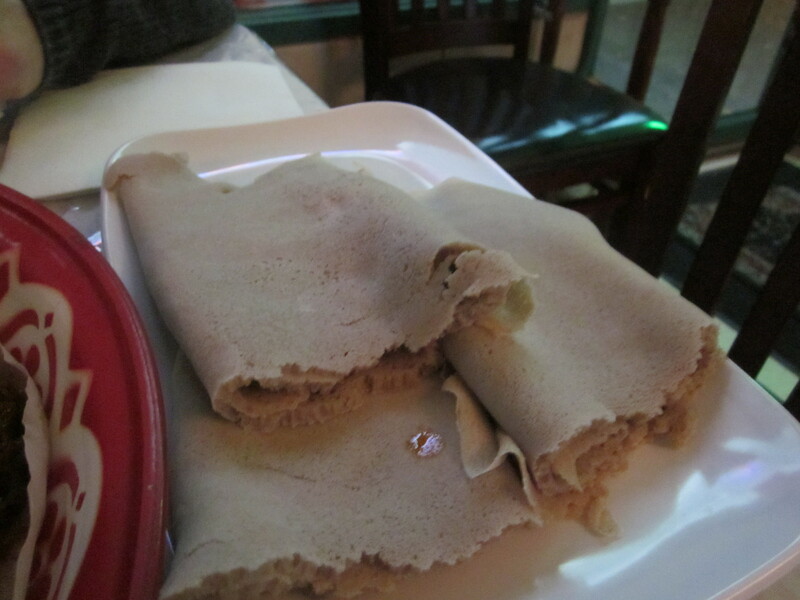 The menu was ample, but as is the case with many of the small African restaurants, it’s hit or miss on what will be available when you happen to be at the restaurant. In our case, some of the West African classics like thu djeun (stewed fish), chicken yassa, and lafidi (rice with roasted goat meat) were done for the day. Our waitress who was scuttling back and forth between taking table orders and returning to the take out counter in the back of the slim restaurant, instead just recited the few items that remained such as grilled chicken, grilled fish, and steak. That didn’t satisfy either Gerry or Zio who persisted, pressing her with some of the other menu items forcing her to squint at the menu. Zio was adamant about the “bouillon avec fonio” also known as cow feet soup while Gerry was intrigued by the “suppa kandja” a mix of lamb and fish in an okra sauce. Keeping it simple for our harried waitress, Eugene and I opted for the grilled fish while Mike from Yonkers ordered the grilled chicken. There were two television monitors at either end of the restaurant where the only decoration was a poster endorsing “Boubacar Bah for President.” The televisions were tuned to CNN and after our enormous platters arrived at our table, President Obama was shown making a speech. The volume on the televisions were turned up and all the Africans either eating or waiting for their take out orders, including the shoe salesman who was leaning against a wall gnawing on a chicken leg, watched raptly. We, on the other hand, did not show as much respect, loudly commenting on how Rick’s guinea fowl looked pretty much identical to Mike from Yonkers’ grilled chicken and both just as dry, while the fish Eugene and I ordered, which we later learned was tilapia looked like they had spent their early years swimming in what probably was a tank in a Bronx farm, consuming a steroid-rich diet, they were both that big. 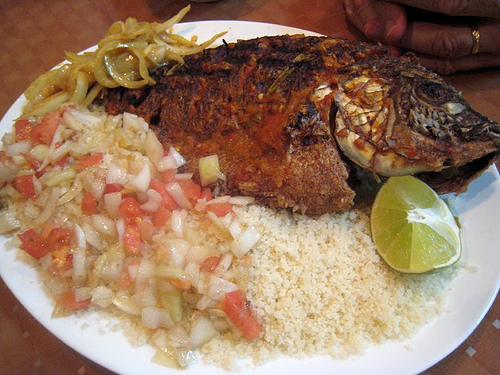 Despite their enormous size, the fish, unlike the chicken, was moist, smothered in a light tomato sauce and served with a mound of cous cous and mustard-flavored grilled onions. 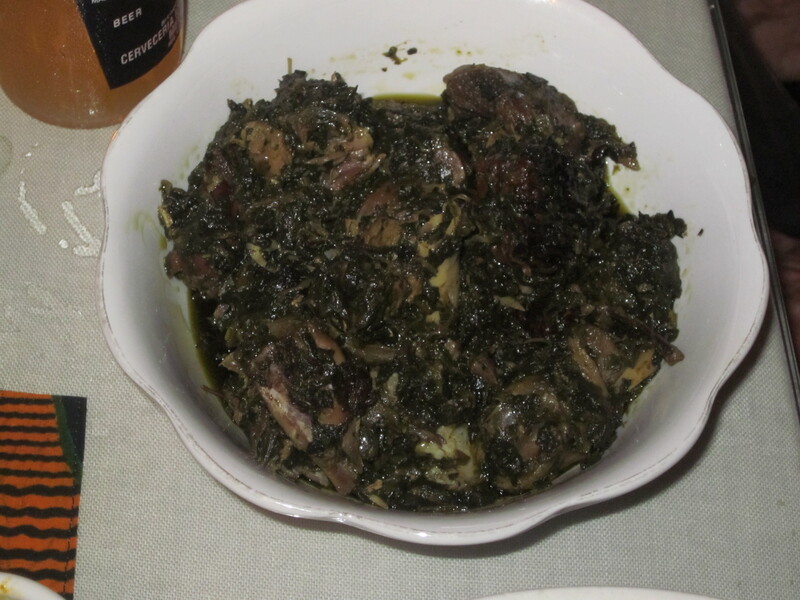 Gerry’s dark green mashed okra concoction had a gamey, overly salted taste that one most definitely would need to acquire to appreciate and the hard gelatinous cow feet anchored in Zio’s soup had him throwing up his hands. “I just can’t eat it,” he said shaking his head in defeat. As Adam Clayton Powell Blvd merged onto the Macombs Dam Bridge, I could see the glow from the blue lights of the joint Yankee Stadiums on the other side of the Harlem River. While I was stuck in the stop and go traffic on the bridge, I noticed that the lettering on the new stadium was slightly different—more 21st Century, than the old one and wondered how much longer I would actually see the two stadiums side by side. 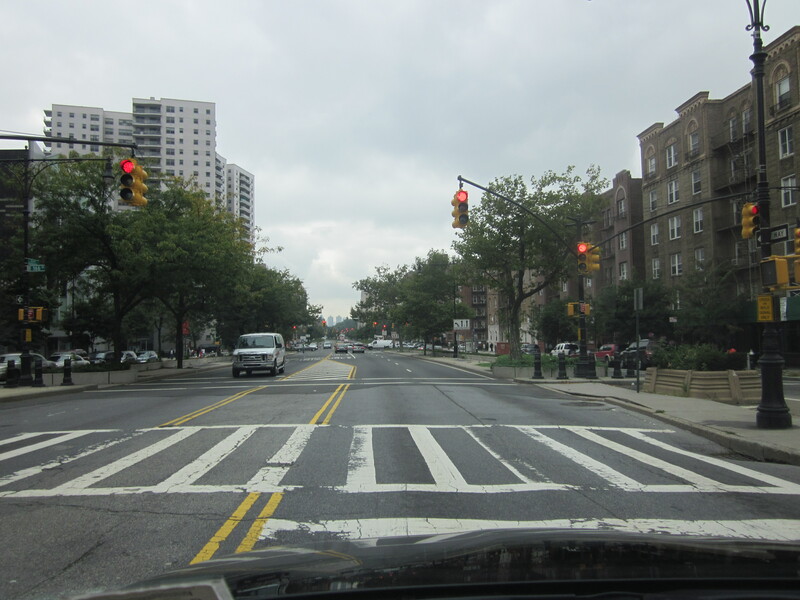 * Once over the river and into the Bronx, I turned onto 161st Street, past Rupert Way, up toward Lou Gehrig Plaza and then north on the Grand Concourse. 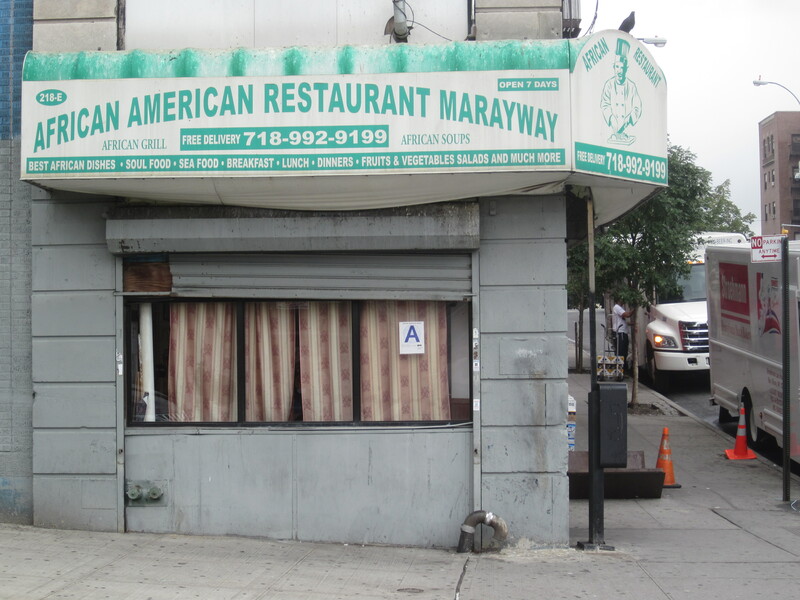 I was heading to a restaurant chosen by Mike from Yonkers called African American Marayway; the name being a mystery since the cuisine was supposedly Senegalese with no nods to African-American staples. 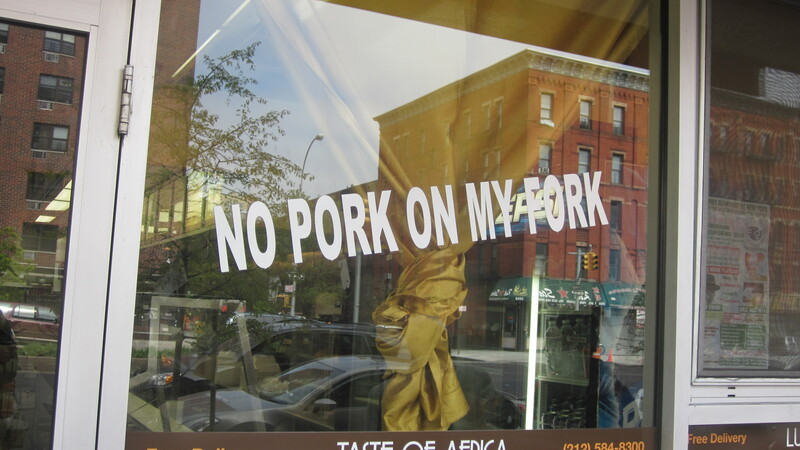 I doubt the Iron Horse ever had the pleasure of dining on Senegalese cuisine. 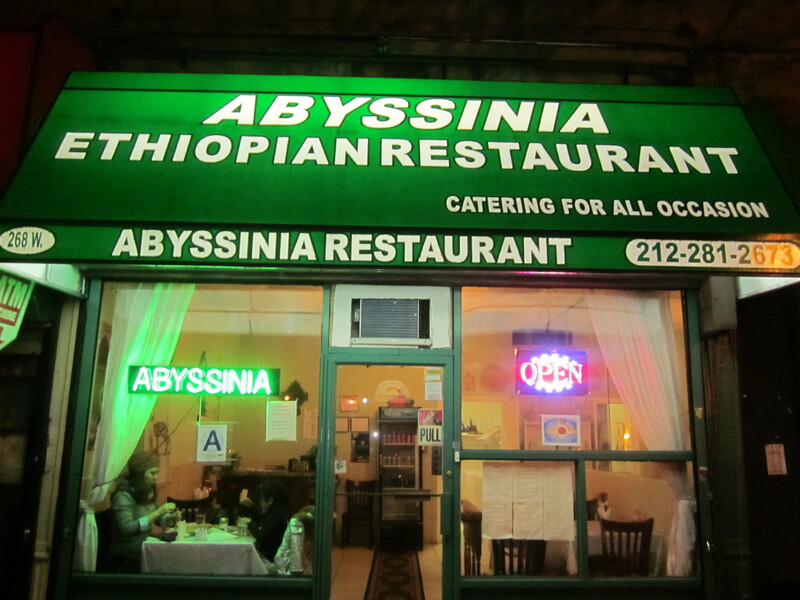 Just off the Concourse on 170th Street, down a hill where cars were parked at angles, I saw the small, corner restaurant. I parked on a very dark, barren street that in its desolation reminded me of the Bronx is Burning days of the 1970’s and was adjacent to a sloping park which, in the dark, looked more like a pit bull dog run than a park. The Champs-Elysees of the Bronx: The Grand Concourse. Everyone, with the exception again of Rick who was dutifully doing his best to play the game and survive in the crumbling publishing industry environment, were in attendance and seated at one of the restaurant’s three tables. 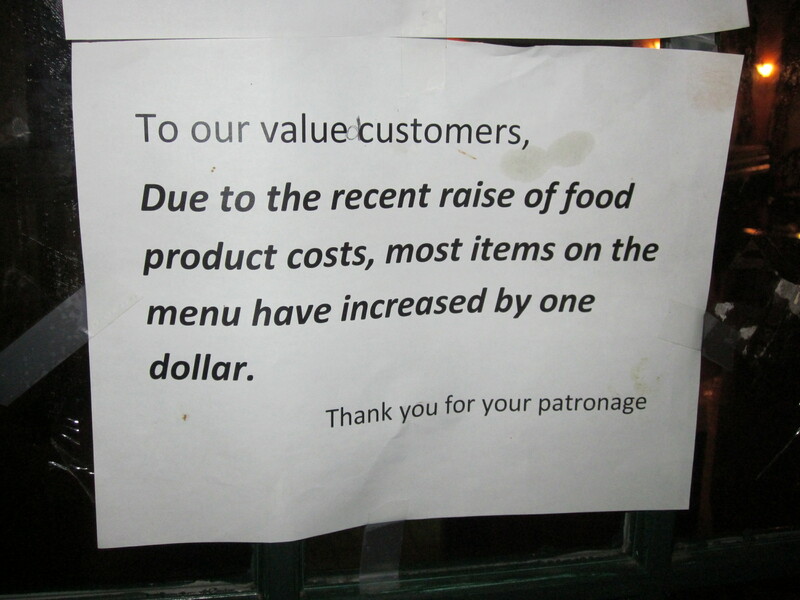 Though it was not an abnormally cold night, the restaurant had no heat and winter jackets were required for dining. There were no menus and our hostess who was also one of the two female cooks situated safely behind a plexiglass counter, mentioned that she had tilapia. We told her to bring that. . .and anything else she had. Though this was as bare bones an establishment as we had been to, there was a television and it was inexplicably tuned to the NASA network where an operative in Houston droned on about satellite readings. 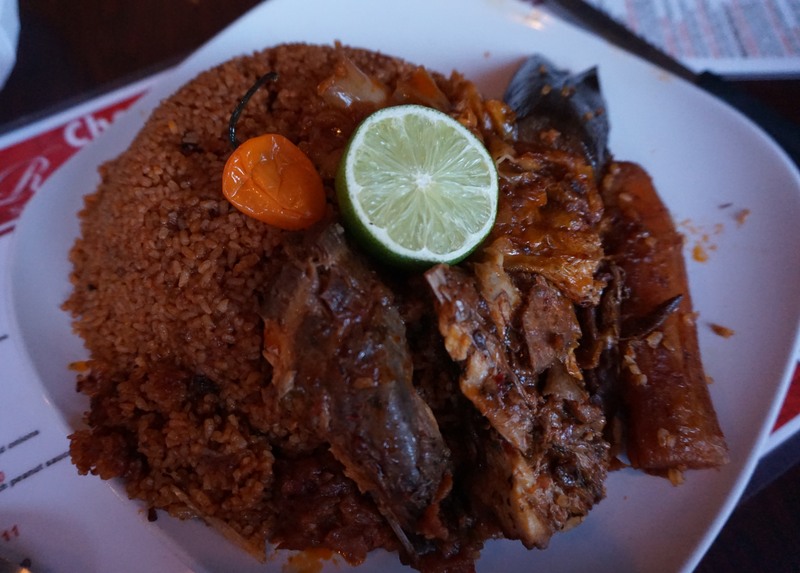 Thankfully a gargantuan whole fish quickly appeared on our table smothered in onions and adorned with lettuce followed by another fish, this one chopped into pieces, accompanied by a variety of roasted root vegetables, and resting on a bed of brown couscous. 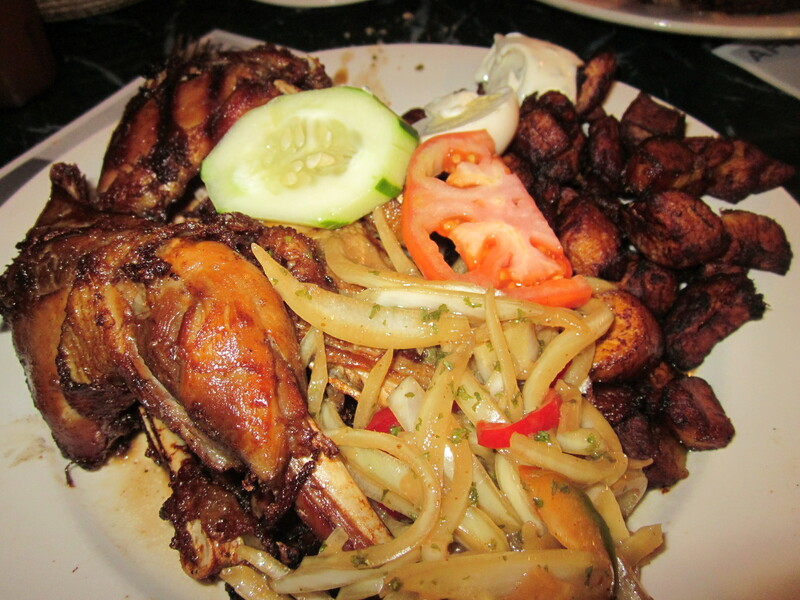 The two platters sat there—we weren’t sure what to do and then our hostess returned with another platter; this one overflowing with white rice along with a plate of meat, (lamb we soon discovered) onions, and fried plantains. We were given a glass with utensils in it and expected to eat from the platters communal-style. When it comes to our group, though we are good at sharing; communal just doesn’t work and we requested additional plates. It took a little prodding, but we were soon given two more plates and a stack of aluminum take out containers. Now that we were free to shovel the food onto our respective “plates” we did so with rapid fire gusto. 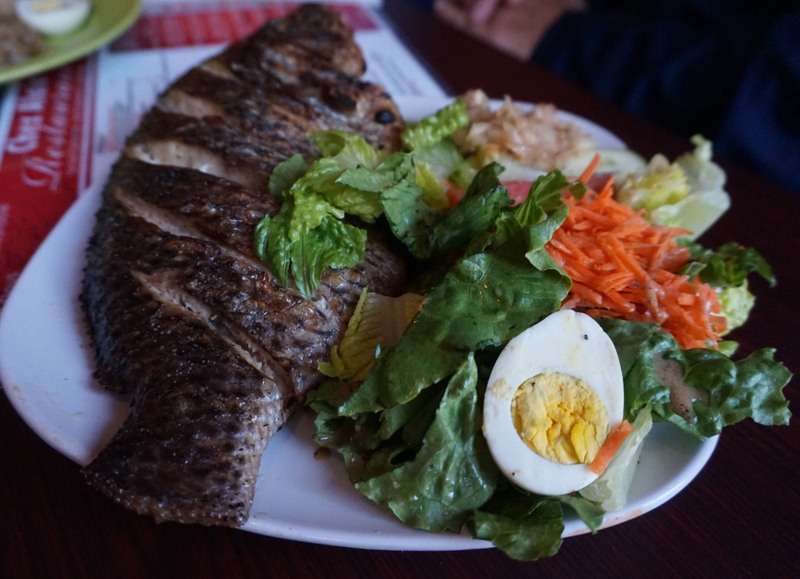 The tilapia, on the bone, proved somewhat tricky, but, collectively our expert bone filleting fingers made clean work of the fish. 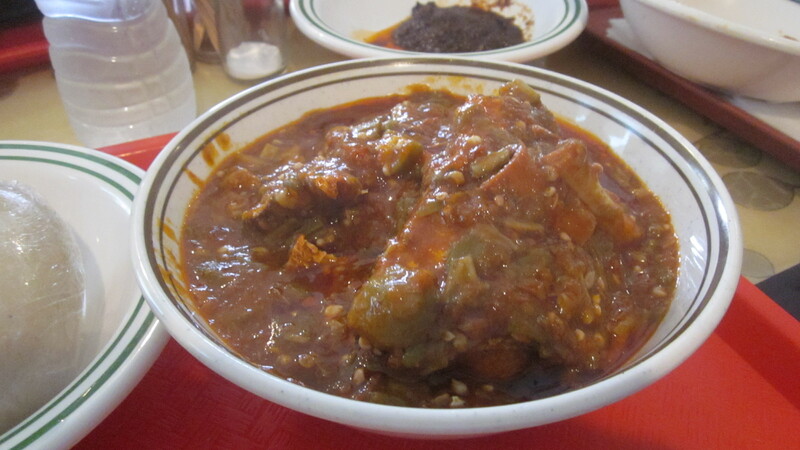 Our hostess wasn’t quite finished; she returned with a bowl of what she called “gravy,’ chicken with onions and rich with palm oil that she suggested should accompany the rice and another bowl of “peanut butter;” a stew of goat meat, in a thick peanut and onion sauce. With the sounds of the Houston NASA technician as background white noise, we worked fast, trying to finish before the food got as cold as we were. Though describing it now, the meal seems like a lot, but at the time, after finishing, it was if we were missing a course or two. And when our hostess told us that for all we ate, we owed a total of $30, almost as cheap as the Old Poland Bakery, the record-setting Polish restaurant we visited in Greenpoint several years ago, the urge to spend and eat more increased. 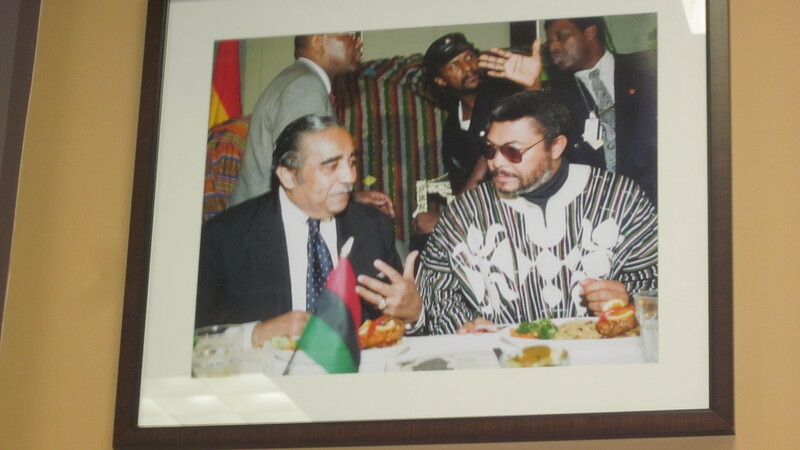 Much of our discussion around the table was about ours and others current economic struggles and as we exited the restaurant, Gerry commented, fittingly, that with places around like African American Marayway, we would never starve. Gerry’s sentiments, however, didn’t deter us from stopping while we were ahead. We got in our cars and snaked north through the Bronx streets to the Italian-American neighborhood of Arthur Avenue in search of more food. 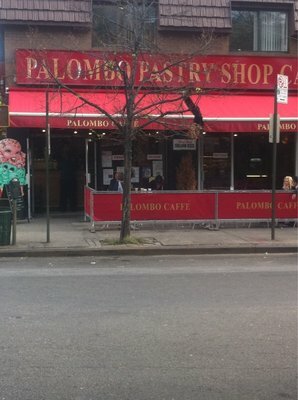 Our destination was to be the famous Egidio Pastry Shop, but it was closed and we settled on one of the neighborhood’s newer establishments, the brightly-lit, garish, Palombo Pastry on the corner of 187th Street and Arthur Avenue. *We visited African American Marayway a few months before the new Yankee Stadium opened and a year before the demolition of the old.